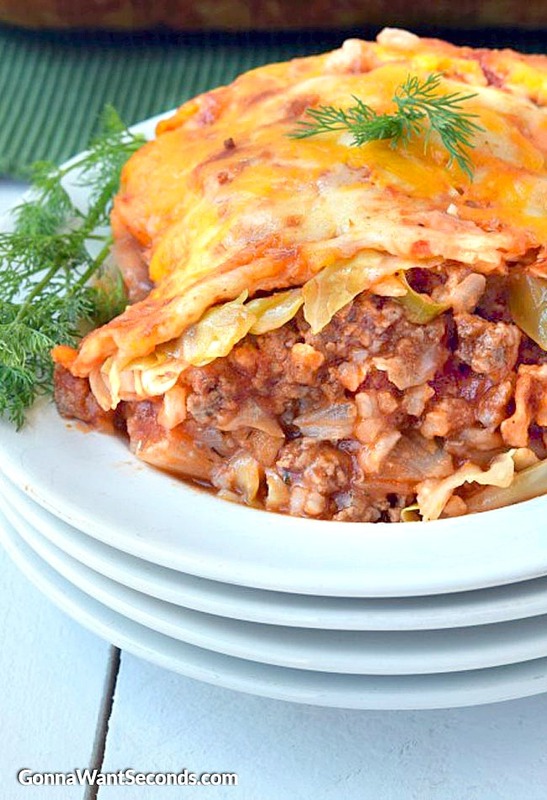 Our Cabbage Roll Casserole Has All The Amazing Taste Of Traditional Cabbage Rolls Without All The Work! Loaded With Cabbage, Beef And An Amazing Sauce! Pin it to your CASSEROLE BOARD to save for later! 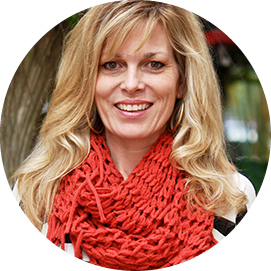 Be Sure To Follow Gonna Want Seconds on Pinterest for more great recipes! Every once and awhile my family craves something different. I think everyone understands nights like that when the typical evening meal routine just isn’t going to cut it. It’s nights like these that family dinner squabbles can get the most intense. Everyone wants a dish no one else wants. I’ve found that I have a secret recipe to quench the growing dinner-time tension: Cabbage Roll Casserole. My family loves this recipe. We’ve always loved the standard stuffed cabbage rolls, but they take way too long to assemble for a simple weeknight meal. It would take me all afternoon to stuff enough individual cabbage rolls for everyone to enjoy. But this delicious cabbage casserole tastes just like old fashioned Eastern European stuffed cabbage rolls—but in a much (much) easier form to prepare. 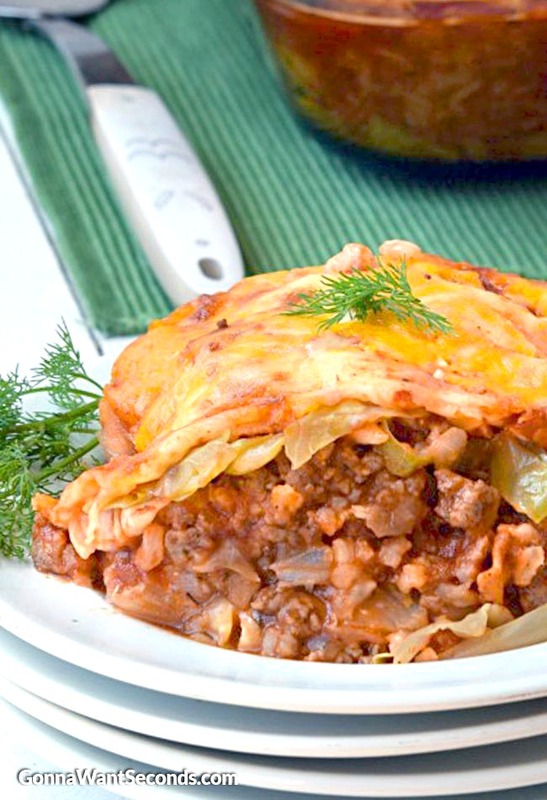 If you’ve ever heard of inside-out cabbage rolls, they’re the same dish as this recipe. Whatever you choose to call it, it’s delicious! Casseroles are a classic family dish. And it’s easy to see why, a casserole is hearty and filling, while simultaneously being quick and easy to put together. Similar to a standard cabbage roll recipe, this dish calls for chopped cabbage, garlic, ground beef or ground turkey mixed together with a sweet sauce. Turning these classic cabbage rolls into a casserole requires assembling the ingredients lasagna-style in delicious layers. One of the reasons I love this dish is that it’s so nutrient-dense. It’s a really healthy meal to serve to my growing family. Leftovers are a necessity for any weeknight dish to be successful. This casserole can be frozen and reheated without any loss of taste. It’s a gift that keeps on giving. This will change the texture of the cabbage. Freezing it will make the cabbage softer for the reheating. If you’ve ever had traditional eastern European cabbage rolls, you’ll notice that there are two ingredients included in my recipe that you wouldn’t typically find in the classic rolls: cheese and bacon. Wow. They may not be traditional, but they are soooo good in this dish. If you’ve ever made cabbage rolls before, you’ll wonder why you never thought of adding cheese and bacon! If your family is anything like mine, they’ll be thrilled, especially the kids, with these additions. 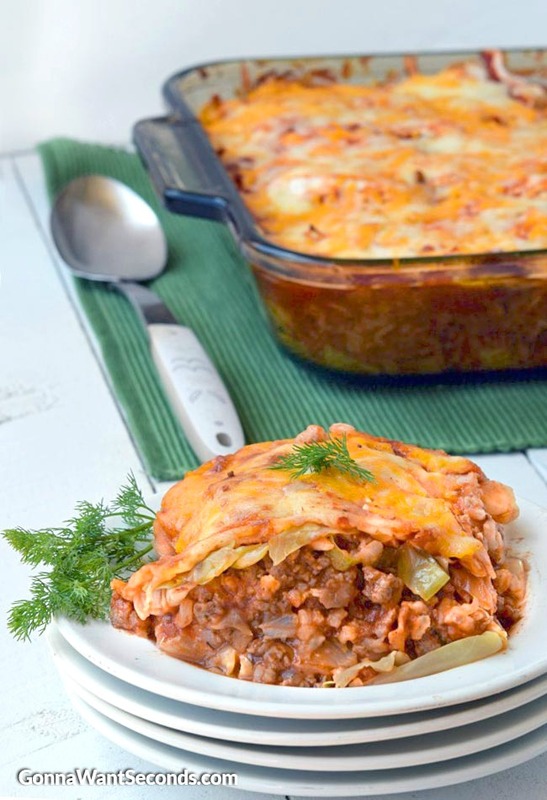 Though what really separates this casserole recipe from other, similar lazy cabbage roll casseroles is the sauce. This sauce is absolutely killer. It’s a great combination of sweet and just barely sour. Typically, the sauce for this recipe is sweet. This recipe falls on the sweeter side of average, but still has a nice contrast and balance with the rest of the dish. Casseroles are a handy tool, and this casserole is seriously one of my favorite ones out there. 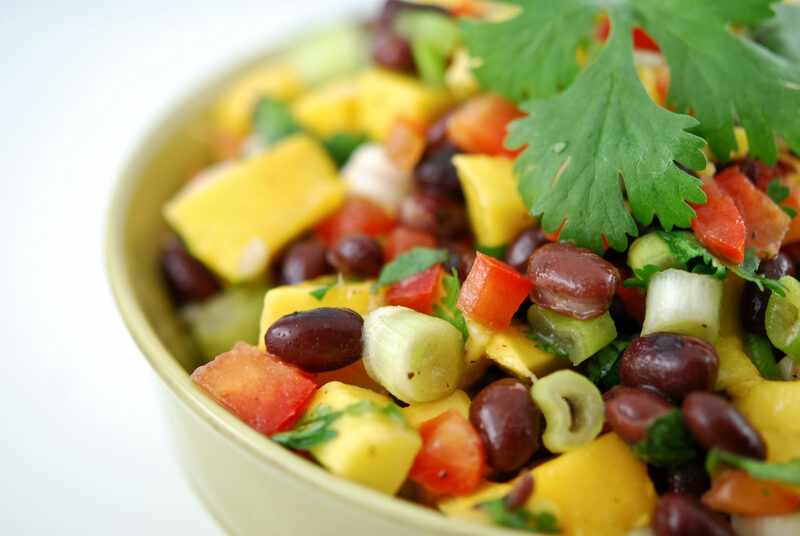 It’s delicious, healthy, and easy to make. My family always wants seconds and I can freeze the leftovers for another meal. What’s not to love? The only problem is convincing myself not to make it every week! 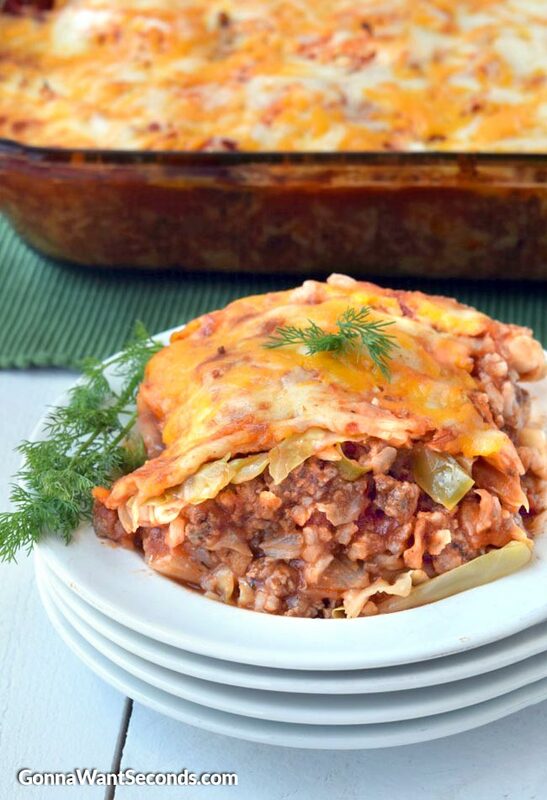 Our Cabbage Roll Casserole Has All The Amazing Taste Of Traditional Cabbage Rolls Without All The Work! Loaded With Cabbage, Beef And An Amazing Sauce! Preheat oven to 350 degrees. Spray an 11 X 13-inch baking dish with nonstick cooking spray. In a large mixing bowl, stir together the ingredients for the sauce and set aside. Add chopped cabbage and stir to evenly combine. Set aside. In a large nonstick skillet, add the olive oil, onion and garlic and saute over medium heat until the onion is soft, about 5 minutes. Add the ground beef, 2 teaspoons salt and 3/4 teaspoons pepper and cook over medium high heat, crumbling the beef as it cooks, until the meat is no longer pink. Drain off fat. Add 1 (15 ounce) can tomato sauce, 1/2 teaspoon dried dill, thyme, sage, bacon and rice and stir until evenly combined. Layer half of the cabbage in the prepared baking dish. Top with all the meat and rice mixture. Top with the remaining cabbage. Cover with aluminum foil and place on a baking sheet. Bake in preheated oven for 45 minutes. 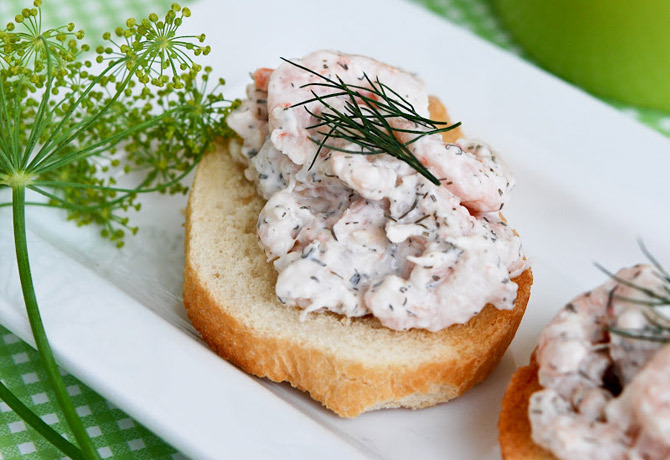 Uncover, then sprinkle top with cheese and bake 20 minutes or until casserole is bubbly and cheese is melted. Let stand 5 minutes before serving. Cooking: Lots of similar recipes use a slow cooker or a crockpot. I think slow cookers are a fantastic kitchen tool. Lots of my recipes recommend using them. And if you choose to go that route with this recipe, that’s fine. Just be aware that the final recipe won’t taste quite the same. I prefer the conventional oven for this dish. This recipe needs a big baking dish to succeed. I recommend at least an 11 x 13. Usually, I place the baking dish on a rimmed baking sheet just in case the casserole bubbles over. Do not use a 9 x 13 dish—you’ll have a big mess in your oven. Cabbage: I use regular or savoy cabbage in this recipe. My family tends to prefer the milder flavor of savoy cabbage, so I typically go with that. But you do what works for your family. Cabbage recipes are sometimes daunting because they usually require chopped cabbage. I do not recommend buying pre-chopped cabbage for this dish. It’s far too fine to work in the final mixture. That means you’ll need to break out the knife and cut that thing up. Cut the cabbage in half first, using the core as the starting point. Then cut the core out completely. Cut the cabbage into quarters, then break it into thinner pieces with your hand. These thinner pieces can be perfectly chopped or minced into exactly the right size. I tend to chop the cabbage into roughly ½ inch pieces. They cook up nicely at that size, coming out soft but not mushy. Whatever you do, don’t just slice the cabbage. It doesn’t cook as well in the casserole. 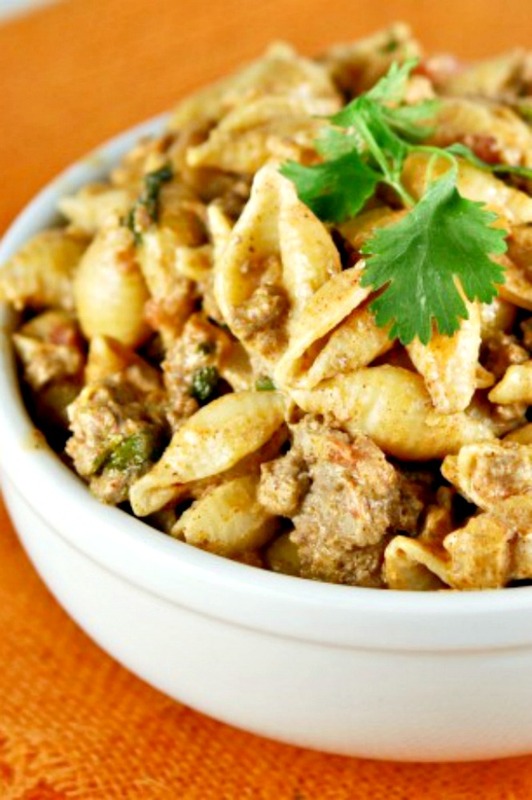 Other ingredients: You can use ground beef or ground turkey in this dish. 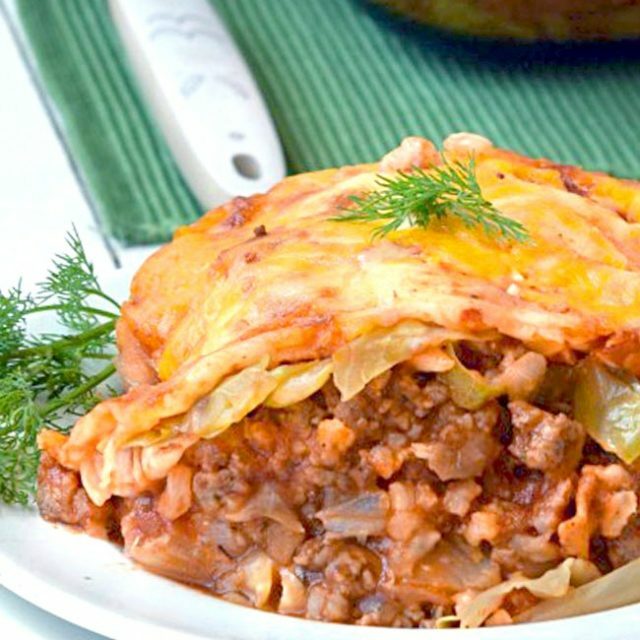 A combination of pork and beef is the more traditional meat ingredient in cabbage roll casserole, but I’ve never been a fan. It doesn’t cook as well into the casserole. 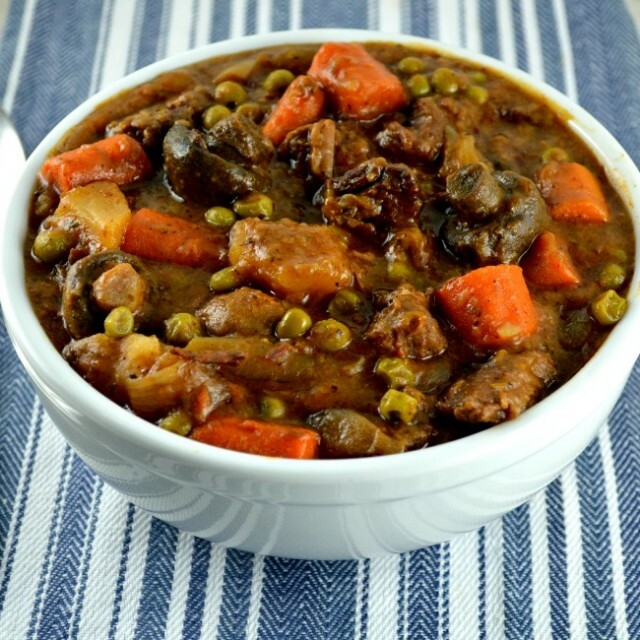 This can also be easily transitioned into a vegetarian dish by simply leaving out the beef. I recommend adding more cabbage if you choose to go with this variation. If you’re not a fan of sour cream (or want to eliminate those calories from the dish) try using Greek yogurt as a topping instead. For the really experimental, use a can of Rotel diced tomatoes with chiles for the cabbage roll casserole instead of tomato sauce. It’s a delicious variation on this classic recipe and is always a hit with people who love spicy food. 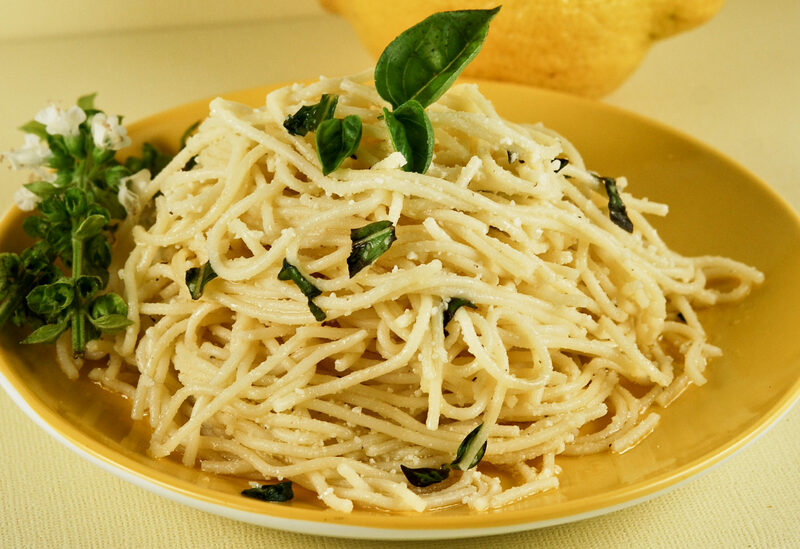 I always use fresh lemon juice in this recipe. The premade stuff in the little yellow bottle doesn’t work here. The artificial, slightly chemical taste will ruin this sauce. To make the recipe low carb, you can try replacing the rice with riced cauliflower. It will taste a little different, but I actually like this recipe variation really well. I serve it maybe every other time. Typically casseroles with rice are best if the rice is a bit firm—not mushy at all. But with this casserole recipe, I like my rice a little mushy. I intentionally overcook the rice and use a little bit of extra water to give this casserole a texture much closer to classic cabbage rolls. Soup: A popular variation is cabbage roll soup. To alter the recipe into a soup, use a can of tomato soup and a jar of pasta sauce. Add a little water to the mixture depending on your preference. Chicken Broccoli Rice Casserole -Chicken, rice, broccoli, all baked in a super, creamy, easy sauce, topped with lots of gooey cheese and buttery breadcrumbs. Chile Relleno Casserole -Infused with all the taste of a chile relleno without all the mess and fuss! Easy Dorito Casserole Recipes – Layered with a zesty beef filling – it has all the flavor of our favorite orange chips without all the hassle of orange finger-tips! 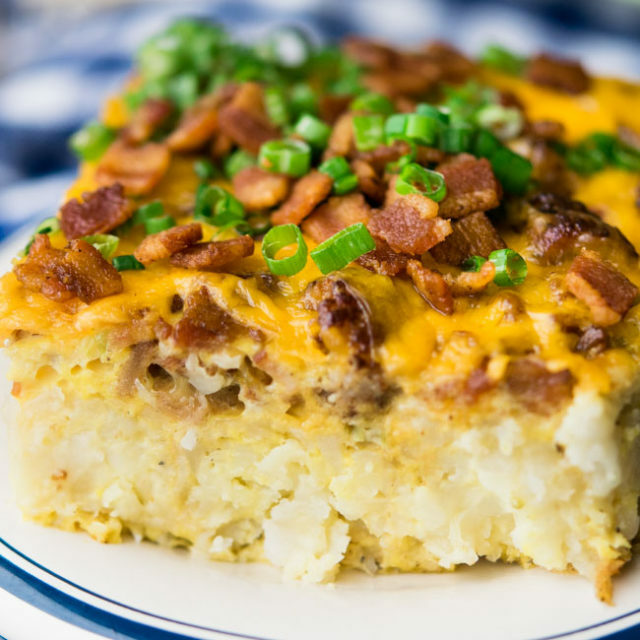 Chicken Tater Tot Casserole– Oooey~goooey, creamy and delicious loaded with chunks of Chicken and Bacon coated with a Creamy Sauce, topped with Cheesy Tater Tots! Chicken Tamale Casserole -Thick layer of a delicious, sweet corn pudding topped with chicken, a little sauce, and loads of gooey melted cheese! Looking for a lighter version? Check out these keto cabbage rolls from Little Pine Low Carb!